The GefenPRO GEF-SDI-AUDE 3GSDI Audio Embedder allows up to four AES/EBU digital audio streams to be embedded into an SDI, EDSDI, HDSDI, or 3GSDI signal. 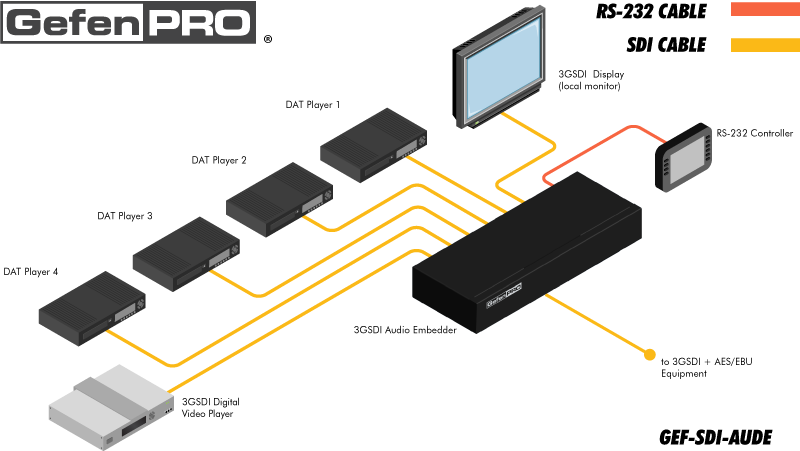 Selection and routing of each audio group / pair can be configured via RS-232. SDI video is integrated with different audio sources (e.g. DAT players, microphones, etc.) to create a single SDI audio/video stream. Connect an SDI source to the SDI input BNC connector. Connect the SDI Loop Out BNC connector to a display for monitoring the unprocessed signal. Connect the Output BNC connector to an SDI + AES/EBU acceptor (such as video broadcast equipment). Connect up to four AES/EBU digital audio sources (such as DAT-Players) to the Audio In BNC connectors. Connect an RS-232 cable from the Audio Embedder to a PC or home automation system. Connect the AC power cord to the Audio Embedder and power on the unit. RS-232 commands can be sent from the PC or automation system to select the audio group and pair to be embedded into the video signal.